I have been having a super busy summer, so the blog had to take the back burner, but I’m hoping to be more consistent with writing – so stay tuned for many more posts. My daughter, Zoe just turned two!! I can’t believe I’m a mother runner of a two year old. Along with chasing a super active two year old, I have been running tons of summer stroller miles. This summer has been a mild one, which has made for some perfect running weather. I also finally got my new running shoes, the Newton Gravity 6. I’ve been running in them all week. Let’s begin by talking about my favorite shoes. I still love love love the Newton Gravity 4s – best shoe ever. When I opened the box it was love at first sight. They were the first running shoes I put my feet postpartum and they were the shoes I trained and ran my last marathon in. The newton gravity 4 had a roomy fit, that was totally weightless. Roomy fit is ideal for long distance runners, because feet might swell as the miles increase. This shoe let my toes spread and my foot move. The tongue on the shoe was so thin you never noticed it there. Not that it matters, but I also loved the look of these shoes! They were orange and pink with silver details. The 5 was okay, but the tongue on the shoe was so thick and large, which was unnecessary. It had a very snug fit, which made the shoe feel stiff. And although, it might have weighed the same, or less than the previous Gravity, it still felt heavier. It was the first time I was unsure about the Gravity. It made me question what’s going on with Newton, the company – especially since the co-founders are no longer with the company and the shoes are no longer sold in any local running stores. I also have been seeing less runners on the trail and at races wearing Newtons. I use to wave at every Newton runner. However, the color on the Gravity never disappoints. These were yet again a badass looking running shoe. After running in the 5 for months, it was definitely time for new running shoes. And because the 5 didn’t impress me, it made me a little nervous to try the 6. I loved the 4 so much, I thought about looking online to see if anywhere was selling it in my size. Turns out after lots of debate I made the decision to give the new Gravity a try. I really don’t want to just run in one shoe, and get my foot use to one shoe. I ultimately want a shoe rotation, and although, I didn’t fall in love with the 5, I never had any injuries. The Newton Gravity 6 is definitely an improvement from the 5. The tongue is still a little thick, but they made improvements by making it shorter. The shoe still feels a little snug, but not as stiff and snug as the 6. I normally where a size 6 in regular shoes, and a size 7 in running shoes. In these shoes, I’m wearing a size 7, but sometimes feel my toe hitting the end of the shoe while running. This makes me question, is it my foot (your feet can change size due to having a child) or is it the shoe? I am missing that unique feel that the original Newtons gave me back when they first came out. Did they change? Or maybe I’m just use to wearing them after years of running in them. Otherwise, they still have everything that I love about Newton. They are light weight (6.5 ounces) with the 5 lugs, and a 3 mm heal to toe drop. They are a badass looking running shoe with the trademark bright color combination. I just hope Newton continues to keep the shoe as minimal as possible. Although, they don’t want to be in the category as a minimalist shoe, they are all about perfecting a naturally barefoot running stride and getting a runner to run more efficiently by landing on their forefoot. Us runners who are loyal to Newton love that they don’t have too much added to the shoe, and that the shoe allows the runner to feel the ground and let their toes spread in a wide toe box. Less is more, when it comes to a running shoe. So that’s it for now! I can’t wait to run all the miles in the Newton Gravity 6. What shoe are you running in? Have you tried Newtons before? I love connecting with other runners, and would love to hear from you. Comment below, and follow me on Instagram @sweat1xdaily. I forgot to tell you, I am registered for the Marine Corps Marathon! I have just finished week 3 of my marathon training. And, although this will be my 4th time training and running the Marine Corps Marathon, things are very very different this time around. My running buddy is Zoe, my 10 month old daughter. And because we are inseperatable, we do everything together… It is not all about me anymore. This has made training a little bit more challenging, but also way more fun! WEEK Day Training with the stroller. During the week, I have been doing my shorter runs pushing Zoe in the running stroller. 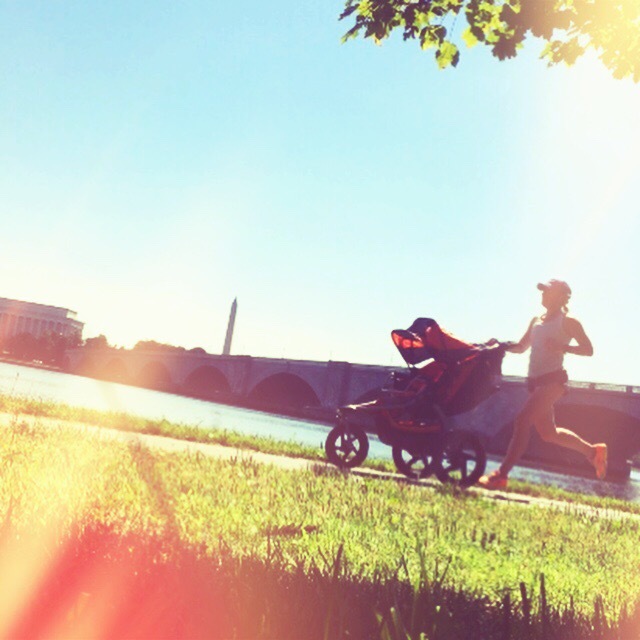 Pushing the stroller is definitely harder than running solo. (For those who are interested, I am running with the BOB revolution, pro. I intend on writing a blog post about the product so stay tuned.) Not only do I have the extra load, the stroller itself weighs 25 lbs, plus Zoe, but my running form is different when I run with the stroller. And although, I have gotten faster running while pushing the stroller, it is impossible for me to pick up my cadence. Which means I must be over striding. When I run solo my cadence is a perfect, 180. But when I run with the stroller, it is low 130-140 spm. I also usually use my right hand to steer/push the stroller. I need to work on switching arms, so both sides of my body are balanced. The longest run I have done with Zoe, is an 8 miler. My legs didn’t hurt, but my arms did by mile 6. The plan is to run my shorter miles during the week with Zoe, but run my longer runs on the weekend solo. Well, of course the first week of training, I told my husband I was going out for my long run, and he told me he had tons of things to do, and he needed me to take Zoe. Because according to my training plan my long run for the week was only an 8 miler, I decided it was doable to bring Zoe along. So off we went for an 8 miler. This was the longest run I have done while pushing the stroller. It was also late afternoon and 80+ degrees. I knew this was a big mistake. I should have gotten out there earlier, but I had to get the miles in. I chose the shadiest part of the MVT, however, the shadiest part is also the hilliest part. My plan was to just chug along up and down those hills, stopping briefly to check on Zoe every 2 miles. 1-4 miles went really well. Miles 4-6, I mentally broke down. Miles 6-8 I pulled it together and finished strong. So strong that I thought I could have kept going for another mile or two. Zoe absolutely loves going on runs with me. It is really nice for her to get fresh air. She loves all the views and the trail gives her lots of trees and water to look at. It is also important for her to see me living an active, healthy lifestyle, enjoying nature. However, with that being said. It takes me between 1 hour and 25 minutes and 1 hour 35 minutes to run 10 miles. I will take Zoe out for a 10 miler, but I really don’t want to take her out longer than that. I am very lucky, that she loves her stroller, and like I said above there are some amazing, healthy benefits about stroller miles, but I can’t keep her strapped in a stroller for longer than 10 miles. Now that she is scooting around and pulling herself up, it is important for her to move, and play. It’s my job as her mama to give her that time and opportunity to play and move, to problem solve and discover. She needs her exercise too. The heat was killer, a lot of runners were falling apart on the trail. But I had my water, and kept chugging along. Over all it was a fine run, mainly slower because of the heat. Once again, I will have more success if I get out there earlier when it is cooler. The heat is definitely taking its toll on me. Getting out there around 9:30 am is just way to late. The more I practice running in the heat, the more my body will get use to it. However, lately it has been a heat wave and it’s just not healthy to run in, because of the high humidity levels. I had a really slow 6 miler and thought to myself, goodness, maybe I can’t do this marathon training. If I’m feeling bad doing 6 miles, what am I going to do next week when I have to do an 11 miler. Although, my 6 miler felt bad during, I felt great after. Later, that night a fellow mother runner, Lina, asked me to do 4 miles with her. It had just stormed which cooled the 90 degree day to 70 degrees and there was a breeze. This was my chance to test myself. It was only a 4 miler, but I wanted to see how I would do. Turns out I ran just fine and all of my negative thoughts from earlier were erased. It was just the heat and running in cooler weather made all the difference. It was also great doing a double, running 6 miles in the morning, and 4 miles at night which gave me a total of 10 miles for the day. The training plan I am following is the Hal Higdon Intermidate training plan. I am interested in heart rate training, and considered following the heart rate marathon training plan by another mother runner. However, for this marathon, I am following Higdon’s plan because I have used his plans in the past and I have always found success. So I’m sticking to what I know works, while throwing a baby into the mix. Although, I love my Garmin, I am also tracking my mileage using Strava! The Strava app is awesome! I love that I can follow other runners and they can follow me. When training for a marathon alone, it is important to check in with other runners and be inspired by their training and give/receive encouragement and support. I will also be reading more running blogs. I read tons of running blogs two years ago when I trained for my marathon and I didn’t feel so alone. Another feature that I love about Strava is how it breaks down your running stats. It also records your PRs. So if you are on Strava please follow me! I’m on there under sweat1xdaily. You can also find me on Instagram @sweat1xdaily. Well that’s all for now! Which marathon are you training for? I hope all of you are almost done with your holiday shopping. Did you know… according to statistics, Yesterday was the second most busy shopping day, of the year, (black friday being the busiest). Anyway I have already posted last year’s awesome list which was Part 1. Now I am going to reveal to you Part 2- this years list – The Best Running Gifts for Runners. I wasn’t going to put shoes on the top of my list, because shoes are tricky. They are tricky because running shoes make or break your runner. The wrong shoe can cause major problems, even injury. However, if you know your runner, runs in a neutral or stability shoe then go head and purchase. Newton running shoes are my favorite. They are a light weight, natural barefoot running shoe. I have convinced most of my running buddies to give them a try, and they fell in love. There is no turning back now. Above is a picture of Raiza wearing (yellow) Newton Distance – universal, Me wearing (orange) Newton Gravity – neutral, Lina wearing (purple) Newton Motion – stability. The bright colors are awesome, and because 2015 shoes will be coming out soon, most 2014 running shoes, including Newtons, will be on sale. I got this running watch in early fall, after I ran the summer w/o a watch because my old Garmin died. I still need to write a proper review. But this running watch is the Mac Daddy of all running watches! It is AMAZING!! Trust me it does everything, recording pace, mileage, cadence, heart rate, and much more. It is like having a running coach, because it actually evaluates your stride and running form. It is $400 w/o heart rate monitor, but find a bundle for $450 that comes with the heart rate monitor. It is way worth the money. This watch will bring a smile to every runner, because it becomes your running buddy and your running coach! Christmas doesn’t have to be all about material things. Races can be expensive and they start to add up. Paying for a future race entry is an awesome gift for any runner who is planning their 2015 race schedule. This was my favorite Christmas gift I got last year. My sister made it for me. It is a really fun gift because the jar is filled with pink paper, blue paper, and green paper. The pink paper has a song title on it. The blue paper has a motivational quote on it. The green paper has a yoga pose or stretch on it. The idea is when ever you are in need for a new song on your running playlist, you grab a pink paper. When you need motivation to get out there and run your grab a blue paper. When you are feeling sore and need a good stretch you grab a green paper. 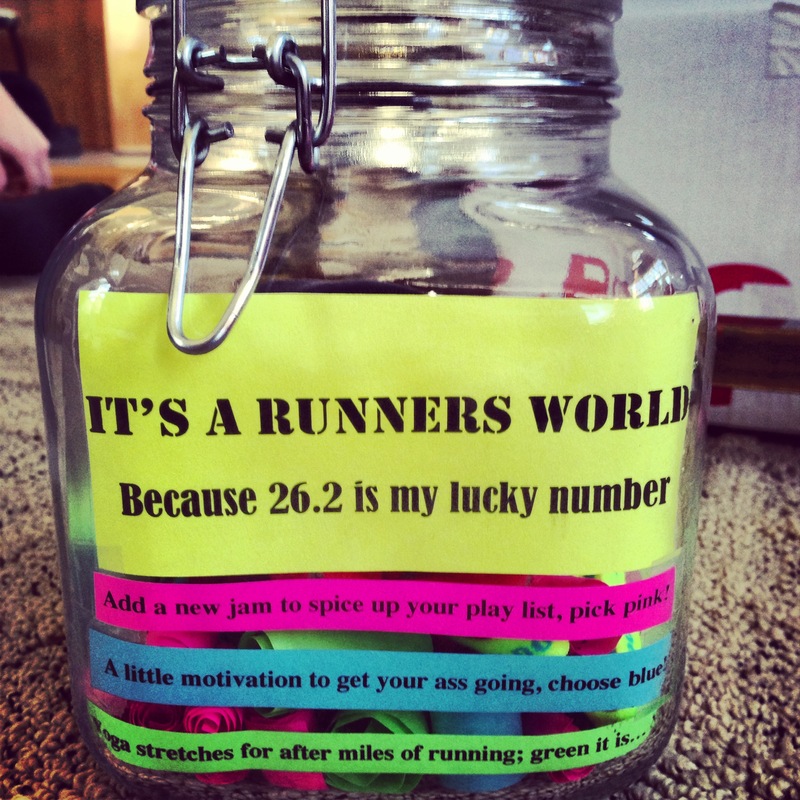 The jar also was stuffed with running accessories such as socks and headbands. I love this idea. It’s crunch time! So go a head and get that one last gift for your favorite runner. It’s Crunch time! Christmas Wish List for Runners! It’s CRUNCH time! You have a little less then one week until your shopping deadline, December 25th is here. If you have a runner on your buying list. I am going to help you, by revealing my Runner’s Christmas Wish list. There are definitely some awesome universal running gifts but there are some that are particular to certain types of runners. Don’t worry I’ll walk you through it. Let’s start with great ideas for stocking stuffers. Sometimes it is the little things that make all the difference, especially during a long run. These little tablets help your runner refuel. They dissolve into your runner’s water with in minutes giving instant energy. Once dissolved it becomes your runner’s source of hydration, giving them everything they need from sodium to electrolytes. The brand also has an ALL DAY option with a lower sodium level, for those runners who want to sip on nuun all day. Nuun comes in a wide range of flavors to satisfy every runner’s taste buds, for only $6.50 a pack. This product is for all types of runners and endurance athletes. These beans are magical beans, at least to a runner that is. They are different from nuun because they don’t dissolve in water. Instead you chew about four beans every hour, washing them down with a gulp of water. And like magic, instantly, your runner feels energized. They refuel and replace everything your runner looses while sweating during a long run. These beans have been with me during every training run and every race from 10 miler to marathon. These beans come in a variety of different flavors. They also come with the option of caffeine or with out. I normally use the ones with out caffeine, because caffeine gives me the jitters while I run and messes up my stomach. So keep this in mind- it is important to ask your runner if they perform well on caffeine or not. These sports beans are only $1.25 a pack, that’s a pretty good price for magic. Imagine this… Cyclists in Belgium training for the Tour de France, eating waffles as fuel on long training rides. This is how Honey Stingers Waffles were born. These waffles come in strawberry, vanilla, honey, lemon, and chocolate and the best part is they are Organic. My favorite is the honey flavor. They come in handy when you are crunched for time and need a quick bite before a run. I also like to keep them in my camelbak for a snack while on a long training run. The brand Honey Stingers also has gels and other refuel items. These waffles are $1.39 per waffle. This may not seam like a very exciting Christmas present, but to a runner it is. Body glide is a protecting layer that can be put on any part of the skin. This helps prevent chafing and blisters. I am that runner who always misplaces her body glide. So I am always buying new ones. I don’t go on a long run or to a race with out it, and honestly can’t get enough of it. Body glide has saved me from a lot of stinging, bleeding, and painful miles. It comes in a small travel size and a regular size. Depending on sized Body glide is $6.00-$10.00. This is for any runner who experience chafing and blisters, but mainly for the long distance runner. I first discovered bondi bands at a race expo and I fell in love. They are the ultimate running accessory. It keeps your hair out of your face, stays put, and absorbs sweat. They also are very personable, coming in different colors with different fun phrases written on them. $8.00 a band, for all types of runners, male or female. Maybe your runner is a sprinter who needs some fast pace music to get their feet speedy… Maybe your runner is an ultra marathoner who spends hours chugging long miles on the trail. Which ever it may be, all runners need some new tunes to keep them motivated and help them push through that last part of their training. The Garming Forerunner is the heart rate, GPS, watch which takes your running to the next level. Use this watch as a tool to understand your heart rate and record your pace, distance, and cadence for all training runs and races. There is a wide variety of different Garmin Forerunners, to meet the needs of all the different types of runners out there. There is even the forerunner 310 that is for the triathlete and can record under water. 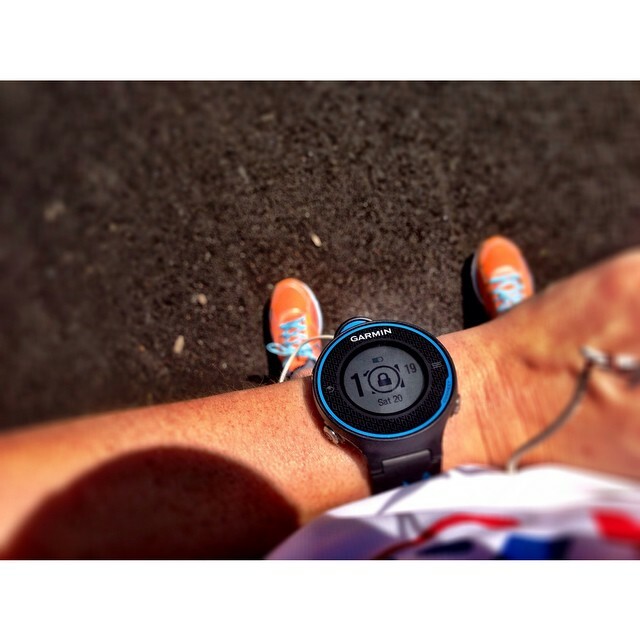 Which ever Garmin you choose, know this… Garmin is the leader in the running community for GPS and Heart Rate. These watches range from $129.00 – $399.99. Newton running is a natural barefoot running shoe that helps you mimic your stride as if you were barefoot. They are light weight, have a low heel to toe drop, but because of their unique lugs they are able to absorb shock. I have been running in these shoes for over 18 months and ran my fall marathon in them. Their motto is Hello Better and it is so true. My running form has significantly improved, I am running faster and better. These shoes range from $119.00- $175.00. There are a lot of different ways to stay hydrated. Some runners prefer a running belt. Others prefer a vest that holds two water bottles one on either front side. I however use a camelbak. When running on trails, or through the city it is impossible to rely on water fountains. I always bring my camelbak for runs 10 miles or longer. My camelbak holds 2 liters of water and has additional pockets for all my other belongings. This is ideal for marathon runners, or anyone running 10 miles or more. Camelbaks range from $50.00 – $150.00, depending on the size and model of the camelbak you choose. A runner will appreciate a high performance sock. It sounds weird, but socks do make a huge difference. I tend to get really bad blisters. But these socks are wicking and sweat absorbing. And although they may look weird, they will save your runner from blisters. These run around $12.00 and they are for all runners, even those wearing the Vibram Five Fingers. I have been reading this magazine every month for the last 7 years. As a runner, Runner’s World is your source of information. It is for all types of runners, from the rookie to the veteran. It touches bases on all types of running from 5K to ultra marathons, revealing the most current gear from shoes to hydration packs. It has inspiring stories, tips for racing, exercises and nutrition advice. It also has a race calender to keep you updated on popular races. If your runner does not have this magazine, they need it. Subscribe for $19.99. This book is by far my favorite book. It is written by ultra marathon Scott Jurek. The book tells the story of his life as an ultra marathoner, who eats a plant based diet. However, it gets a lot deeper then running, when he talks about his friends and family. My favorite part is that this book also has pages of great recipes. This book has been out for a couple years now . It is a national best seller, so odds are that your runner may have already gotten their hands on it. However, if not this is a must read. This book is about the epic adventure Christopher Mcdougall goes on to answer the simple question of why his foot hurts when he runs. He discovers that what we thought we knew about running was all wrong. We are born to run, barefoot. Read this book and your will not only be inspired, but all your questions about running will be answered. If your runner has already read, Born to Run, then The Cool Impossible is the next book to read. This book will become your running coach. Teaching you how to strengthen weak areas, so you can have proper running form, and transition safely into a barefoot runner. Make sure you are a Kind Runner! Check out kindrunner.com. I wish you the best this Holiday Season, and although, there is tons of pressure to give the best presents, in the end it is not that important. Always remember the true meaning of the Holidays is to be with each other. A week after Marine Corps Marathon, an email from Marathonfoto was patiently waiting for me in my inbox. For me, this is like Christmas. I am always excited to to receive my race photos. The image of me sprinting to the finish line just like an elite runner always flashes across my mind. Maybe, they’ll snap a photo of Erik waiting for me so I can smooch him in celebration of a new PR, just like elite runner Emma Coburn did in this photo. Or maybe this time, I’ll look just like Kara Goucher, my arms in the air, breaking the tape with a smile of victory across my face. I’m patriotic, I’ll carry an American flag too. Well turns out I can keep dreaming, because my race photos never turn out that good. However, because of the improvement in my running form, they have been looking better and better. 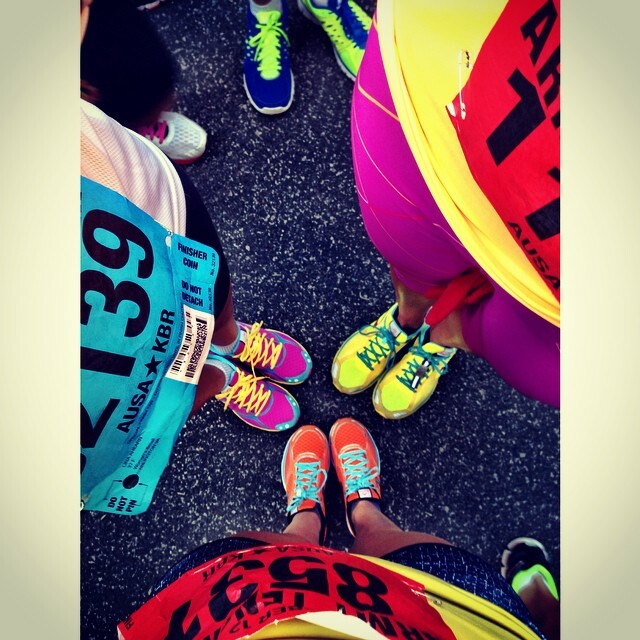 Your race photos are important and can actually be very beneficial for you. So even though, you may not look like Kara Goucher, do not ignore your race photos. It is important not only to look at your race photos, but also analyze them. It is your race photos that will reveal the truth to you, about your strengths and weaknesses in your running form. Have you been feeling pain? Have you had the same running injury over and over again? Well there is a reason why, and maybe you can find the answers to all of your questions by looking closely at your race photos. So lets take a look at mine and start critiquing my running form. 18 months ago, I switched my shoe to a natural barefoot running shoe, and since then I have really focussed on transitioning my form from a heel striker to a mid foot/forefoot natural barefoot running stride. And although, my running form has improved significantly, it still isn’t perfect. In some of the photos you can see that I lean back instead of forward. This is something that I was doing and didn’t even know it. In the photos that I am leaning back in, it looks like I may be over striding. Another interesting thing is that I land on the outside of my foot. I already slightly knew this by examining the wear and tear at the bottom of my shoes, but it is revealed as well in these photos. In order to get my foot landing more even on the ground, I am going to have to strengthen my gluteus medius. Sometimes it takes strengthening a muscle or stretching a muscle to solve a problem. As for strengths, the biggest thing I am proud about is that I am consistently landing on my forefoot. I am very balanced in every photo. In most photos, my stride is short and bouncy with high knees. Overall I am happy with how far my running form has improved. I can’t stress enough how important running form is. You wouldn’t go play golf without knowing how to properly hold the golf club, so if you are new to running, do not just head out for a run, learn how to properly run. If you can improve your running form, in most cases, you will stay injury free. So go ahead, take the time, to examine and analyze your race photos. They are one of the best tools to use, to reveal the truth about your running. This was my first time running this distance in a natural barefoot running shoe. There was a time durning my training that I was nervous about running that far in my Newtons. But I built up to it and had an awesome marathon in them. Below is the song I had in my head, the story I told myself. Below is my experience running my 3rd Marine Corps Marathon, revealing everything to you, including my mental strategies. Around 10:00 pm, I read the Marine Corps Marathon Facebook page status. It said something along the lines of, “It’s bed time! Sleep Tight runners.” I laughed at the idea – no one sleeps well the night before a big race. I curled up in bed, everything prepared exactly the way I wanted it, totally ready for race day. My alarm was set for 6:00 am, but I knew I would wake up before it went off. I wasn’t nervous, I was more excited and anxious. It was definitely bitter sweet, this marked the end of my marathon training, and when I woke in the morning, it would be the beginning of my race day. As I predicted, I tossed and turned through out the night, checking the clock. At 5:50 am, the text messages started. Friends and family wishing me good luck for my big race. I turned off my phone alarm and headed to the bathroom where all my race stuff was laid out. After getting dressed in my race clothes, body gliding everything including the bottom of my feet (my problem area), I grabbed my bag, my Garmin, my iPod, my peanut butter sandwich, and a bottle of water, then I was off to my mom’s. I arrived at her place, at 6:30 am, gave her a map of the course and a game plan of where to meet me through out the race. My little sister, even rolled out of bed to give me a quick pep talk, it was super helpful. I was already starting to feel pumped. Because of Boston, security was tight, everyone had to have a clear see through bag, but the Marines kept it organized and checked bags quickly. At this point it was 7:20 am, so I stripped down- peeling off my sweats. I checked my bag with the UPS trucks, stuffing everything except for my phone and sports beans into my bag and then handed it over. I was wearing shorts and a tank top and people began to comment, “Wow, looking at you makes me cold.” I answered back,” I am more concerned about overheating and being hot.” I had thought about wearing an old shirt, and old socks on my hands as gloves, but honestly, I didn’t think it was that cold out there, and I knew it would warm up quick. I saw people wearing long pants, hats, ear muffs – I thought they were crazy. It’s not January guys. So I headed down to my corral. The last two times I ran this race I stood with the 4:30 group. This time I wanted to try to hang with the 4:15 group as long as I could. This race has 30,000 runners, so it is going to be packed, crowded. My sister thought it would be best to start with the 4:30 group so that way I wouldn’t go out too fast in the beginning. I however, was planning on running most of the race at a consistent pace that would get me to the finish line, with a new PR, which meant anything faster than a 4:30, but I was hoping for around a 4:15, and because of how crowded it can get I didn’t want to get stuck running to slow in the beginning. So my advice to you, when running in a crowded race, and you are debating between corrals, start with the faster one. Once in my corral, I spotted the 4:15 pacer, she had a sign with red and white balloons. My plan was to run my own race, but keep my eye on her through out the race. I had my Garmin, and I had a pace bracelet (which I highly recommend), both of these would help me finish strong, with a new PR, so if I lost sight of the pacer, it wouldn’t ruin my race, plus she was passing the start line before I would be. In the past, right before the gun went off, they would announce that, “The Marines are watching over you, on the ground and in the sky,” then they would fly military jets over our heads. This year they had people sky dive in to the corse. Everyone had their phones out trying to video tape and get photos, trying to capture the moment. It was really cool,creating an excited energy. Everyone was jumping up and down, and ready to cross over that start line. The gun went off at 7:55. At 8:10, I was across the start line, my Garmin was ticking. Down 110, up through Rosslyn, up the Lee Highway hill… Then on the right hand side, around mile 2, outside my sister’s apartment, I spotted my mom, Erik, Erik’s mom, my sister, and her friend Erin. They cheered loud, I cheered back, waving and continued on my way. They had really funny signs, that got them tons of attention. Down Spout run, up to the Key bridge, over the bridge, down M street, down Wisconsin. George Town was fun and full of spectators. Then to the waterfront, up Rock Creek park, I ran. Running up Rock Creek was a new part of the course. It was fun to run up, and then see the faster runners running down. The loop around was a little congested, though, and then it took a little while for people ahead of me to pick up their pace. I guess people don’t run fast down, the down hills, but I like to, that is part of my strategy – as long as you don’t pound the pavement and you stay light on your feet, use momentum and physics to fly down the down hills. Before I knew it I was at mile 10. This marathon was flying by. I checked my watch, I started to get concerned maybe I was running too fast. But I was right on time. My family was suppose to meet me at mile 11, but around 10.5 I saw my sister sprinting next to me. What the heck… She screamed at me, that I had missed them and that instead of being at mile 11 they were at 10. She asked me if I had been receiving her text messages. I ended up moving my cell phone from my back pocket to my sports bra, so I would be able to read and respond to her text messages. Haha, I can’t believe I was texting and running – too funny. The next mile marker my sister would be at was mile 16. She would text me when she got to her exact location. Next, significant mile marker I was passing was 13.1. I couldn’t believe I was already at the half way point. And while I was there, down in Hains Point, I realized I was running right behind the 4:15 pacer, balloons and sign. I turned off my music to listen to her pep talk. “We are not going to think that we still have a half marathon to run, but instead we are going to break the rest of this race up in pieces.” Perfect I thought, that was one of my original game plans. She continued,”First we are going to think about getting through these next two miles and making it to mile 15. Once we are at mile 15, we will be out of Hains Point, which means we will be out of this stupid park.” I couldn’t help but laugh, because it was so true, no one running the Marine Corps Marathon, likes running Haines Point. “Once we are at mile 15, we will be running on the National Mall. At mile 15, we will think about getting through the next 2 miles and making it to mile 17. This mile is a significant meaningful mile in a marathon because it takes us into signal digits.” Perfect that was another mental strategy I had been practicing. Then she told us, “From 17 we will run the next three miles and make it to mile 20, then we will beat the bridge and head out of DC and into Crystal City.” She told us she would stop talking now, and give us another pep talk on the bridge. Some guy who was totally out of breath desperately said, “Just get us there!” Haha this pacer has a lot of people depending on her. I loved her pep talk, it definitely motivated me, but I didn’t desperately need her to get me to the finish line. Her pep talk was helpful and got me even more mentally focused, but I still wanted to stick to my game plan, and watching my Garmin, running my own race. I then felt a vibration, and read a text from my sports bra. Em was waiting for me at mile 16 right passed the water station. I was at mile 15, I had easily made it out of the oh so boring Hains Point. I was running towards mile 16. Just like she said, I spotted Em right passed the water station at mile 16. Erin snapped a photo of the two of us. They were impressed with my timing, and told me that they would meet me in Crystal City next to the Cosi. So off I went. I had made it to mile 17, and thought, single digits, single digits, 9 more to go. I was feeling great! I kept running, checking my pace bracelet, checking my Garmin, jamming out to my iPod. Then I realized I was leaving the National Mall, and approaching the 14th street bridge. I had made it to mile 20. In my previous Marine Corps Marathon, a Marine stands at mile 20, the start of the bridge, and he yells, “Mile 20, beat the bridge.” This year the Marines were there but they didn’t say anything. I was a little disappointed, but I kept my head focused. The bridge is almost 2 miles long. It can be super sunny and hot, or really windy and cold. This time around it was sunny and hot. This is also the spot where there are normally no spectators. It is just too tricky for spectators to get on the bridge. Ironically though, there were more this year, than the previous times I have run it. But because there aren’t that many spectators, this is the spot that a lot of runners, begin to walk, or stretch. Finally, I got off the bridge. I was out of DC and in VA. At mile 22, I decided to take some sports beans and walk the water station. But I didn’t hang there too long, I started running again, and told myself that I need to get to Cosi, to find Em. I kept my eyes open for other people I recognized, but I didn’t see anyone. Em was right where she said she would be, she is really good at spotting me. She jumped in just as we had planned. She was going to run the last 3.2 miles with me. She was going to be my Dusty. I was excited to have a buddy pace me to the finish line, especially since mile 23 was when I started to feel tired, and blistery on my left foot. Lululemon was also cheering in Crystal City. Along with some really funny signs, their energy made me get a second wind. As we ran, through Crystal City Em, told me that mom, Erik, and Erik’s mom were standing out front of Legal Seafood. They had changed the course from the previous years, and instead of looping all around Crystal Drive, we ran Crystal Drive and then turned up 23rd, passed Legal Seafood. I didn’t look at the corse map too closely, so this was a surprise to me, but it made more since and I liked it better. The finish line would be my last and final stop. I grabbed one last water cup at the final station, popped some sports beans, and told Em, “Let’s get this bad boy done.” She ran a little ahead of me, but I was totally fine with chasing her, it made me try to keep up my pace, blisters and all. At mile 24, I though only 2 more miles. I will be done with my 3rd Marine Corps Marathon in less then 20 minutes. Although that seemed so short, at the same time the finish line seemed so far. But just like in my previous two MCM, I saw the road sign that said, Memorial Bridge Exit. “Just get to that sign,” I thought. Then I was there. The next road sign I read said, Iwo Jima Memorial. “Just get to that road sign,” I thought. Then I was there. I made a left and saw the hill. Em wanted me to sprint up the hill as fast as I could. I had run this hill thousands of times before, because it is a part of one of my regular weekly running routes. I was familiar with this hill and new the finish line was right after it. So I ran as fast as I could up the Iwo Jima hill. And then, to the right of the hill, there it was the Finish line. I had crossed over the finish line, finishing my 3rd Marine Corps Marathon, 11 minutes faster then my previous. My official time was 4:19:26. I had finished, I had set a new PR, and couldn’t have been happier! Marines were there to greet us at the finish line. I was lucky to get a very cute one to put my marathon finisher medal around my neck. After, I walked around the finisher’s area, collecting all my goodies, I headed to brunch with my family. I sucked down two Blood Mary’s and ate donuts, at Lyon Hall. It was the perfect post race meal. So… Thank you, Thank you, Thank you, from the bottom of my heart. * I have purchased all of my race photos from marathonfoto.com. I have not received my downloads and that is why I have the proof photos up. When the professional photos come, I will post those. Marine Corps Marathon Expo and the GAME plan! Yesterday, Friday, October 25th, I hit up the Marine Corps Marathon Expo. I got the DC armory around 1:00 pm and it was obvious that everyone else decided to come at that time too. It was packed. Getting my bib number was a breeze. No lines at all. But entering the actual expo had a line because security was tight. They had to check people’s bags. While in the line I met a girl who came from Pittsburgh to run the race. One of my favorite things about MCM is that so many people from so many places come to run this race. Once inside, I wished her luck and went on my way. When approaching the tables to get my race shirt, the Marines called me over, waving an XS shirt at me. I thought it was funny. I guess I am XS. I also want to say that I am really happy they changed the race shirt. It is still a turtle neck but at least the material is not cotton and the color was quite nice. I continued on, got my picture taken with my bib number, and collected all the other free samples that they were handing out. I ran into the mid atlantic sales rep for Newton running. It was fun seeing here considering she got me into wearing Newton shoes, and tomorrow I will be running a full marathon in them. I went to the Brooks running area. Brooks is sponsoring the race. I picked up a Marine Corps Marathon hat, and running jacket. I also got a pair of brooks running socks that I am super excited about. It was a crazy long line to pay, but was worth it because I love my new gear. I finally got out of the Brooks running area and walked around to see what else the expo had to offer. I checked out, Nuun, Honey Stingers, Cliff, and many other venders. Overall the expo was fun, well organized, and got me pumped for race day. I also picked up a race bracelet that has my pace for each mile. Tonight, my mom made me a homemade pasta dinner. I definitely loaded up on carbs. Now, I am sipping on water, trying to stay hydrated. After, I am done writing this blog post I will update my iPod and make sure my Garmin has full memory. Then it is bed time for me. Race night ritual – I am planning on running in my Newton Gravity, my neon green lululemon shirt, and my black lululemon tank. I will cover myself in body glide, wear my garmin, iPod, pace tracker bracelet, brooks socks. I will refuel with sports beans. Race morning – I am planning on waking up at 6:00 am. Because all of my race clothes are laid out an ready, I will quickly put them on, grab my race bag, and a peanut butter sandwich, and head over to my moms. She offered to give me a ride to pentagon city metro. I’ll jump on the metro, get off at the Pentagon, and follow all the other runners to the start! Race Strategy – Normally, I watch the documentary, The Spirit of the Marathon, to get me pumped the night before my race. If you haven’t watched that movie, it is a must, especially for first time marathoners. But tonight I skipped the movie and reread some of my favorite quotes from Scott Jurek’s book Eat and Run. This was really helpful, to get me mentally ready. This quote is exactly how I have been practicing my long runs, and how I am ultimately going to run this race. I will break it up piece by piece, every 5-6 mile taking sports beans, and water at every available water stop. I have been working on my running form ever since I started running in the newton shoe. Focusing on form has been a huge part of my training. Finding your rhythm is also important, because soon you get into that rhythm and your able to run and run and run. The above quote is true, and it is one that helps me remember, that a marathon more than anything is a mind game. I need to keep my mind positive. Because when it comes down to it, I have trained hard for this race, and physically my body is ready. You would be surprised what your body can do. When I start to feel any pain at all, I will keep this above quote in mind. The above quote has been on this blog before. It is my all time favorite, and the quote from the book that touched me the most. It is the truth, and the reason why I run. Mantras – At mile 17, I will tell myself, I am entering single digits. When in doubt I will tell myself to keep moving forward. So there it is… I don’t think I left anything out! Good luck runners. This is going to be an awesome race! Marathon Update: Yoga & Long Run. Why do I enjoy hot yoga? No one explains it better, then Scott Jurek… so if you haven’t already, read the quote above, because that is the answer to the Why. This week has been a really strong workout week for me. I ran a short four mile run on Sunday night after I got off work. This run really kicked off my week in a positive way. It felt really rejuvenating. I didn’t look at my watch. I just ran. I ran some down hills and ran some up hills. I ran fast, and worked up a good sweat, even though the night was breezy. I’ve realized how much I have missed these quick mindless runs, and have wished I had included more of them during my marathon training. So for this last month of my training, I am definitely going to do more of these. They get my fast twitch muscles moving, and they free my mind from trying to keep a slower more consistent pace. No complaining here! It was gorgeous outside! My favorite kind of running is the kind in the fall when you can wear running shorts and a long sleeve shirt!! On tuesday, I was hungry. As an athlete nutrition plays a huge role. You have to fuel your body in order to perform at your best. The week before, I didn’t meal prep and found myself desperate, at times even with hunger pains. So I went to MOM’s Organic Market and stocked my fridge full. On wednesday, I completed an easy 5 miler. On thursday, I completed an easy 8 miler. I ran three miles on the trail and then took a loop around the monuments. It was gorgeous. On Friday, I did an easy 4.5 miler, and then completed a hot yoga class, with my sister, E. We tried a new studio, called Mind the Mat. I had been wanting to try this studio for a while now. I am just so stuck in my ways and end up going to Bikram always. I have been practicing Bikram yoga for 5 years. Out of those 5 years, this was my second time trying a different type of yoga. I am going to write a full review about it this week so stay tuned. Today, Saturday, long run day! I have been pretty bored doing the same trail over and over again. Today, however, I abandoned the trail and ran 13 miles through the city. My sister, E, came with me. This is the first run during marathon training that I have actually run with someone. It was way better than running solo. We ran tons of good hills, we even ran through the zoo. We ended up lost over near the Tenleytown PR at Partners. I couldn’t believe I was that far away from my car. The only negative thing about city running is the constant stopping because of street lights, and all the people on the sidewalks. Overall, it was a great run! I am happy to say that 13 mile runs now feel easy. Next week is my 21 miler, which I might make into a 22 or 24, we will see how I feel. I’m ready to push past my limits. I’m pumped to practice one last super long run. Then it is all tapering from there. Do you prefer running in the city or on the trails? Marathon Training Update: Walk breaks during long runs… Beneficial or Not? Yesterday, I did my 20 miler which I ended short at 18 miles. My mental strategy was to break this 20 miler into 4 five milers. I was going to sip water every 2 miles, and take water and sports beans every 5 miles. I stuck with the plan and took my first sips of water at mile 2. At mile 5, I was feeling so good I skipped the water and beans until mile 6. At mile 9, I was still feeling good, but came to the end of the trail so had to turn around. At mile 13, I mentally lost it… I felt really dehydrated. My mouth was sooo dry. I didn’t put ice in my camel back so my water went warm. No matter how many sips of water I took, my mouth still stayed dry. My stomach also started to feel bad, which is another sign of dehydration. I remember reading in my training plan, that it is okay to walk if you need to, and sometimes walking is beneficial. This is training, practice for the real deal. It is about getting the miles in. So I decided to walk a little to see if that would help. I have decided that walking is not a good idea for me because once I started walking it was hard to start running again. I really needed that second wind. I really needed that runner’s high, that you only get from keeping a consistent running rhythm. But walking took away the chance to be consistent, get a second wind, and runner’s high. So now I know that walking doesn’t work for me… No walk breaks during the marathon unless I’m at a water station. By walking I also realized that physically, my lung capacity is good, but what felt tired were my feet. I find that very interesting!!! Maybe my Newton shoes work great for me at the half marathon distance, but I need something more for the full marathon distance. However, because I have been training in them all this time, I’m not going to switch now. I mainly have a few blisters on my left foot. I’ve also noticed my recovery time in between long runs is longer. I am not the type to get disappointed when a long run goes bad. Bad long runs are great leaning experiences. And I am excited I have another 18 miler under my belt. 1) Eat before I hit the trail… Something I forgot to mention was that I didn’t eat much before going out there. This caused lack of energy and stomach pain. I usually eat a bagel with peanut butter. A good combo of carbs and protein normally always works well. What doesn’t work well, is any type of Cliff bar or energy bars, these have too much fiber which causes really bad stomach problems. 2) I didn’t refuel properly. Water was warm, not enough sports beans consumed. This caused dehydration, which caused dry mouth and stomach pain. 3) Started walking and couldn’t comfortably start running again. This made me loose my running rhythm and I never got my second wind, never got my runner’s high in my second half of my long run. I hit the wall and could not recover. 4) I love my Newton shoes but maybe they are best for half marathons and not full marathons. My feet at hurting after 15 miles and my recovery time has become longer. However, my feet hurting is mainly blisters on my lift foot, which is minor, so I still am planning on continuing my training in them and they will be my marathon race shoes too. 5) Bad music. I desperately need to find some better songs for my running play list. My music is really old, and it bores me. I need music when training by totally solo. My music saves me, and helps me push through during those last miles. I need to make sure I fit in all of my weekly runs. Shorter runs are just as important then long runs. Running shorter faster runs feel amazing. I ran a really speedy 4 miler tonight. It felt amazing. I need to squeeze in those weight lifting sessions. The stronger I am, the better I run. I need to make sure I am eating properly in order to refuel and have the energy I need. I need to meal prep so I have food on hand, and I don’t resort to eating unhealthy, because I am desperate. I need to drink more water. Hydration is key. Anyone have any other marathon training tips? Do you think walking during long runs is beneficial? It didn’t work for me… does it work for you? What is on your running playlist?